Is the paint on your home past its prime? Top Touch Painting Services can provide you with the help you need through the best residential painter Sydney. We will help you to get rid of that tired old paint job and restore the look of your home today. Our professional painters utilise the best equipment, so you are getting the results you can count on. When we are finished, your home will look brand new. We offer painting services for the inside and outside of your home. Talk to us today about the kind of painting you need and we will be glad to deliver. We respect that we are on your property and pay attention to the details. You will not have a mess to clean up when we are finished, because we take care of everything. Trust in us to get the job done right the first time. Stop looking at your fading or cracking paint today and call us at Top Touch Painting Services. You will receive the help of the best residential painter Sydney has to offer. Best of all, you will be able to receive the kind of prices that will make house painting more affordable. 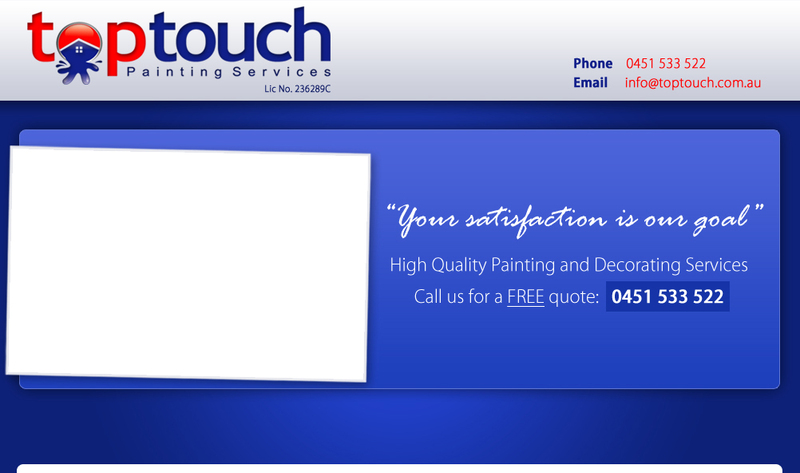 Call today to book your painting service on 0451 533 522 or by email on info@toptouch.com.au.